One of the good things about going to quilts shows, aside from buying fabrics, is the opportunity to get inspired. 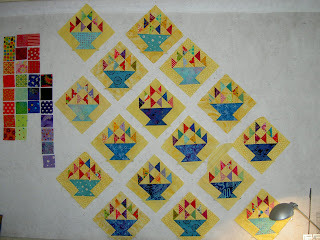 Due to the large number of cheerful quilts, I am really inspired and anxious to sew. TFQ and I started a basket quilt based on a block in a quilt we saw at PIQF 2007. We saw another quilt with the same block at APNQ 2008. When we got to my house after the show, we worked on it again. Above are the original blocks and the colors/fabrics (left) that we are auditioning for the next groups of blocks. We decided to make 9 more blocks and, thus, needed more of everything. TFQ had a plan, so we had searched out and bought all of the butter yellow fabric at the show. The right butter yellow is not the *it* yellow fabric this year and we had a hard time finding it. One aside about fabric is that it seems like fabric is only available for a short time. I understand that fabric manufacturers need to sell new fabric all the time. However, I buy fabric on spec and it is usually a few years down the road before I get around to using it (remember the whole drama with that Denyse Schmidt fabric???) and knowing whether I like it. I understand that, like book publishers, they can’t keep all fabrics in print all the time. Still, I think it would be a service to either keep track of fabrics people are missing OR every few years reprint some of the popular fabrics from a line. In fairness, the FOTY project is an effort to use a bit of the fabrics I buy right away, so I can see whether I really like them and buy more in a timely manner. I have to remember to keep that in mind while I am cutting and sewing the FOTY pieces. This is the whole piece minus some of the setting triangles on my design wall now. I have a whole dissertation on those d*mn setting triangles that I hope to spare you. I am really pleased with how it looks. I stared at it for about 45 minutes this morning and could only find a few minor pieces to move around. I am anxious to get busy and sew it together. Of course, I still need to cut most of the setting triangles. Above is a detail. The block in the upper left hand corner is one of the new ones that we pieced this year. One of the things TFQ did is pay more attention to which triangles were going together in each block. She gave me little sets of all the pieces already sorted so all I had to do was sew them together. I really enjoy sewing with her as we divide up the tasks and can accomplish a lot more. I am really pleased with how cheerful the whole quilt is looking. Now to the setting triangles problem. Figuring out the size is the problem. If I were truly organized, the whole quilt would have been laid out and measured and figured out before I started sewing. That is just not how I work. Where is the fun in knowing exactly how things come out? That is not to say that I don’t have any idea in my mind, but I do leave the sashing (yes or no) and layout (on point or straight) decisions until after I have made blocks. I want to see what they need. OK, you are not going to be spared the dissertation. Sorry! Skip the next paragraph if you can’t deal with my setting triangles drama. I bought a cool new ruler to easily cut setting triangles. BAH! It is impossible to figure out how it works so we couldn’t use it. TFQ, who is GREAT at figuring out directions, gave it a go. No joy there either. What a waste of money. We resorted to looking through a number of books to try and find the directions. I know now why I don’t do on point sets that often, because the directions in a variety of books are atrocious. 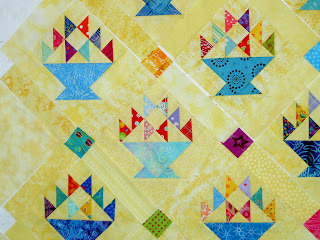 The best chart we found was in the Joy of Quilting and it gave no direction for blocks with sashing. I guess people don’t make quilts that are designed for an on point setting and have sashing. We ended up guessing. I haven’t cut all of the setting triangles yet, because I want to sew a couple of blocks together with the sashing to see what size they end up and they fit with the guesstimate of the setting triangles size. This is a book that I mostly use as reference. 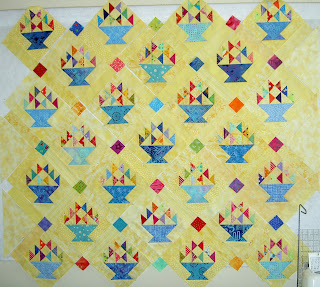 One good thing about it is that it has chart of the sizes to cut setting triangles for an on point quilt. This chart only works for blocks with no sashing. maybe I’m missing something basic about the setting triangls but why not simply add the sashing size into the block size and have “odd” sized blocks when you figure out the math? Once I sewed the sashing to some of the blocks, this occurred to me also. I haven’t tried it using the chart yet, but will later. Thanks for confirming what I was thinking.